The charitable arm of the Chartway FCU in Virginia also made $150,000 donation to Make-a-Wish Foundation. Thanks to a $150,000 donation from Chartway Federal Credit Union’s We Promise Foundation, 15-year-old Christopher Santos-Palm will have the opportunity to set sail on a care-free Caribbean cruise with his family over the holidays. Here, he is pictured opening some special gifts to enjoy during his holiday getaway. 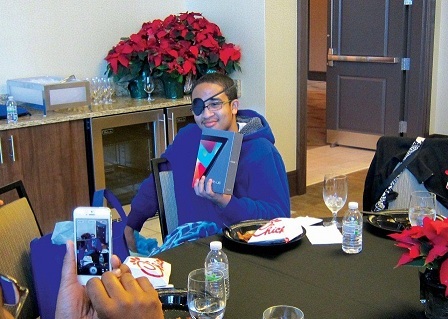 The holidays are a time of giving, and Chartway Federal Credit Union in Virginia Beach, Va., has granted a gift to 15-year-old Christopher Santos-Palm and his family that they will never forget.